Alan Deacon gave a special talk titled “Appreciating the art of Maud Lewis” at the AGNS this Friday September 19 in the Community Room. 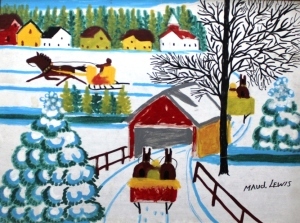 Deacon not only has the largest private Maud Lewis collection in Canada (spans three decades of her work), he also authenticates her paintings for all the major Canadian art auction houses. In 2011 and 2013 Deacon gave a talk at the Mayberry Gallery in Toronto for their two successful Maud Lewis exhibitions. He says, “It’s rather like being a detective! Authentic Mauds always have certain nuances in the work. I think that’s how I became an authority–by studying and looking at them closely.” This talk is sure to be informative and entertaining! Everyone is invited. No charge.